This spacious chest is perfect for storing blankets, clothes, and toys. Features include a reversible aromatic cedar/birch veneer bottom. Two lid support hinges provide added safety. 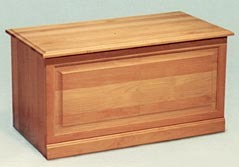 Solid Alder and Birch hardwood combine beautifully with sturdy construction to create an heirloom. Made of solid alder and birch hardwoods. Designed with ample storage to hold a variety of items such as toys, blankets and clothes, this multi-purpose chest will be perfect for your home. Features include a reversible aromatic cedar/birch veneer bottom. The lid support hinge provides added safety. 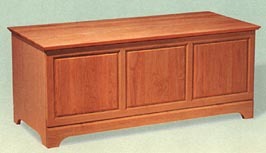 Durable construction ensures many years of use, while the alder and birch hardwoods contribute lasting beauty. Made of Alder and Birch hardwoods.